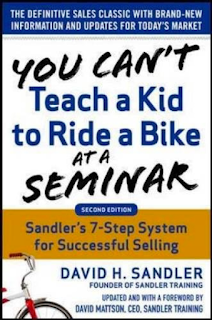 In keeping with my theme of sales books this year, I read David Sandler’s You Can’t Teach A Kid To Ride A Bike At A Seminar. Sandler is also the founder of the sales training company with hundreds of franchise locations across the world – Sandler Sales Institute. I was recommended this book from a former Sandler sales trainer as one of the preeminent books on sales like SPIN Selling and The Challenger Sale. It was one of the first books to break down the complex sales process, and was written to heavily qualify sales opportunities. The gist, like SPIN, was to get the prospect to qualify themselves and want to buy vs. the sales rep selling. I admit this wasn’t my favorite sales book. It wouldn’t be in my top “self-help” books. However, I think I need to re-read the book to better understand the pieces of the book. 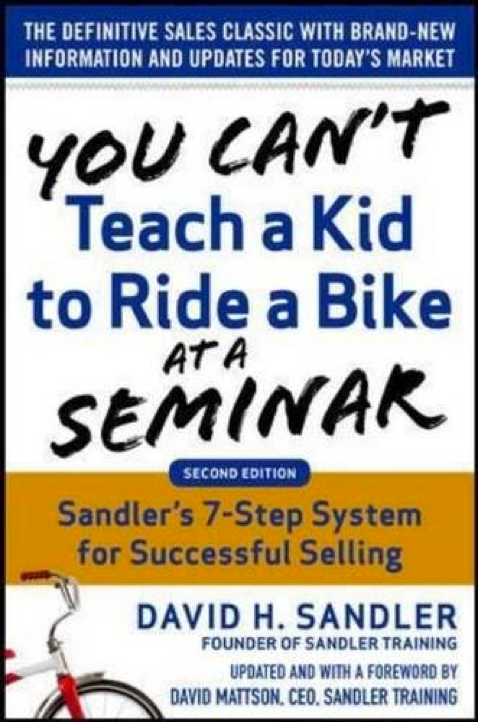 As it stands, I was thrown off by the many self-promotions of the book and its clear lead for the Sandler Training courses. Sandler goes into depth and length into teaching the reader to separate the Identity and Role of a person (I/R). Sandler recognizes the difficulty of sales and “close” rates such that results can be de-motivating. He wants readers to recognize that sales not who a person is – trying to separate who someone is with what needs to be done. Thus, sales can be coached and improved. Monkey’s fist is a sales concept borrowed from marine life – instead of tossing a heavy rope to tie up a boat, shipmen will toss over a lighter “monkey’s fist” that is tied to the heavier rope. This allows a reciver on a dock to easily catch the fist and reel in the heavy rope. This concept is used in sales as a means to easy a prospect into a sale rather than going full bore into a sale. Buyers buy when they feel OK. This can be counter to aspects of The Challenger Sale where a Challenger teaches/ challenges a prospect. In many ways, this can put prospects off. Sandler points out that buyers want to feel “OK”. If they don’t feel OK, then they will be defensive and not in a receptive position to listen to you. Mitigate buyer’s remorse when a prospect may back out at the last second, or cancel an order shortly after buying. In this case, Sandler offers tips to slow down the sales cycle by offering a recap of what the buyer is looking for, how the product/ service enables the prospect, and confronting any “negative” feelings head-on. Sandler highlights the importance to follow up with prospects to make sure they want what is being bought. This is another area where reverse psychology can play a role making the buyer talk him/ herself into completing the buy and being happy with the decision. Using an upfront contract throughout the sales cycle helps the prospect agree on nexdt steps prior to any step is truly taken. This enables prospects to more likely move forward with a sale – “advance”. As I said, this was not one of my favorite sales books. It is indeed packed with good sales information. However, it was not the more engaging reads while the breadth of the book was a lot to absorb.